With a pretty simple story and a humor level that is tailored for kids, the movie does have a handful of decent ideas going for it, but overall, there’s not nearly as much spectacle or creativity as there should have been. Unfortunately, a vast majority of this movie doesn’t work. The story mostly takes place on earth, with the characters trying to get to Tomorrowland. The ideas are pretty simple, and the humor level is definitely for kids. With a minimal amount of action, it’s a real shame how this one turned out, because there was a lot of potential here. Clooney is good, as usual, and in the last act of the film, some real ideas about motivation and perspectives on the world finally start to come out. At that point, however, it’s a little too late. Tomortowland is a movie that looked like it had a lot of potential. Forget that this is based on a Disney theme park and that the last movie series to do anything close to that was the Pirates of the Caribbean films (like the Matrix movies, if they had stopped after one, without making sequel after sequel, this would be considered a modern classic.) The reason why Tomorrowland looked like it would most likely be good was because of the names attached. George Clooney and director Brad Bird. 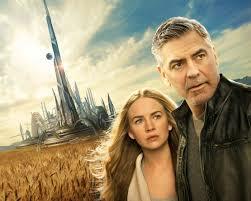 Clooney is obviously a talented actor who picks his projects well. He picks movies that have substance and meaning to him, and most of them happen to be pretty good. With that in mind, he has definitely had some misses in recent years, from The American to The Men Who Stare at Goats to Monuments Men, the guy is definitely losing his touch. Still, he has made enough good choices to still inspire faith that what he’s doing is most likely worthwhile. And then there’s the director, Brad Bird, the real reason to anticipate this movie, or so it would have seemed. Bird was an animated film director and up and comer with Disney when he made The Iron Giant, Ratatouille, and The Incredibles. He then tried his hand at live action and made Mission Impossible: Ghost Protocal (quite an ambitious first live-action film.) That movie turned out to be great, and was one of the better films of the Mission Impossible franchise. And then Bird made Tomorrowland. Now had he not made that Mission Impossible movie, there really wouldn’t be much of a surprise that Tomorrowland turned out the way it did. After all, it is a kid’s movie through and through. One could easily see Bird going from the Incredibles to this. If only that Mission Impossible movie hand’t been so damn good. So why is it that Tomorrowland doesn’t really work? Probably because it doesn’t have a whole lot to do or say. This is a movie about another world, meant to promote the Disney theme park as a place for the greatest minds and inventors in history. Only the movie doesn’t really explore that world. The entire landscape of it is computer generated, and as such, it’s just a background image that never feels like reality, or even an alternate reality. There is no gravity or exploration of the features of this world. Instead, the movie wants to act like it’s about something, but really be about something else. That’s why more than three quarters of the film takes place on present day earth, with the characters simply talking about or trying to get to Tomorrowland. At the start of the movie, Frank (George Clooney) is telling his story about the World’s Fair in New York in the sixties. He is being prompted to tell this story by Casey, and the two of them have some banter about how boring Frank’s story is, none of which is very funny. This is clearly humor for kids. When Frank tells his story, we see a flashback to him as a boy at the World’s Fair, trying to show off his new invention, a jetpack. He brings it to an inventor’s booth where he meets a judge named Nix (Hugh Laurie), and a little girl named Athena. Frank tells them that his jet pack doesn’t quite work yet, and they send him away. Only Athena gives him a special pin and tells him to go to a specific ride, and the next thing you know, Frank is headed into Tomorrowland. Once there, Frank is confronted by a giant robot (the coolest scene in the movie) who takes his jetpack from him, makes a few adjustments, and fixes it. Frank uses the jetpack to fly around Tomorrowland, and then we suddenly cut to Casey and her story. Casey’s story involves her breaking into a NASA facility and destroying the launching equipment. We learn that her father is a repairman there and that the company is about to take his job away. By destroying things, Casey is making it so that there is more to repair and so that her father will have to stay on longer. I understand having the hero of a movie really be a kind of anti-hero, but did she really need to be doing something criminal? It’s a lousy introduction to her character, and it catches up with her as she winds up in jail. That’s where she’s given the pin, which we see in all of the previews. The pin is something special, and when Casey touches it, she is transported to another world. This is pretty cool for a while until the pin runs out of battery life. Now Casey goes on the internet and tracks down people who say they have other versions of the pin. She goes to their store and the shop owners attacks her, looking for information. That’s when Athena (the little girl from Frank’s childhood flashback) shows up and saves the day. The shop owners who attacked Casey turn out to be robots, and Athena drives her to Frank’s house, where she meets the grumpy older man for the first time. At Frank’s, it takes a while for Casey to get inside and to get Frank to actually talk to her. He doesn’t really side with her or give her a chance until the house is attacked by spies who are after them. Frank pulls out all the stops here with the house that is loaded up with traps. He eventually gets himself and Casey out of there, and along with Athena, the three of them take a trip to the Eiffel Tower in Paris. This tower turns out to be a launching site for a rocket ship. It was at this point that I started imagining little kids write this movie, seeing the Eiffel Tower as a place that looked like it could launch rockets. From the Eiffel Tower, they are able to take a rocket to Tomorrowland, and now we are back there for the final act of the movie. So far, the entire film has really felt like just a bunch of filler. It’s like they were trying to hold us back from getting to Tomorrowland for as long as possible so that they could save it for the ending. And what did they give us to fill all of that time while we were waiting? A flashback to Frank as a child and then two attack scenes (The store and Frank’s house.) None of it was really necessary to the plot. 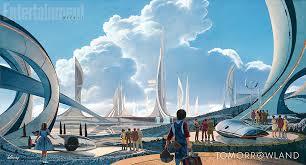 The final act of the movie takes place in Tomorrowland, and for the first time, we get a villain. This would be Nix, who we haven’t really seen since the start of the film when Frank was just a boy. Nix wants to keep Tomorrowland a secret because he has seen the future and sees that mankind destroys itself. He has a long speech about how if you try to help people, you have to go through a middle man, and it takes forever and never works out. But if you cut out the middle man and just show people what their fate could look like if they don’t start making drastic changes, that should work. Only it doesn’t, and instead, showing people their future only leads them to make it happen sooner. This is his logic. But there are problems with it. Like why keep showing it to them? If that idea doesn’t work, then stop doing it. Of course Nix turns into a psycho-killer just in time for the climactic battle, but none of it has real weight or meaning. His speech and evil plans were interesting, but the problem is that they don’t hold up to logic. And then it’s Frank and Casey fighting against Nix and trying to outmaneuver him. This is cliched material all the way. While there’s a lot to criticize this movie about, there are also things to like about it. For one, Nix’s argument is interesting and thought-provoking, it just isn’t followed all the way through. And then there are the visuals here (such as those giant robots), which are a lot of fun. If only the story was better or they spent more time exploring the world of Tomorrowland as if it were a real place. For Brad Bird, I am disappointed. He definitely could have done better.